Inspired by San Francisco 49ers quarterback Colin Kaepernick, a Texas fifth grade student takes a knee to protest the U.S. National Anthem at her middle school during the daily recitation of the U.S. Pledge of Allegiance. Unlike Kaepernick, who says he kneels during the playing of the national anthem to protest police brutality and black oppression, 10-year-0ld Skyla Madria said she knelt periodically over the past two weeks to protest the barely known, unsung third verse of the poem written by Francis Scott Key that would become the national anthem. It mentions slavery. However, students at Alexander Middle School do not sing “The Star Spangled Banner” each morning when gather at the campus gymnasium. Instead, Madria uses Pledge time. A Pearland Independent School District official told KHOU that students only recite the U.S. Pledge and the Texas Pledge followed by a moment of silence every day. The girl’s mother, Elizabeth Owens, told reporters she wants an apology from the school district over how the incident was allegedly handled. She then contacted community activist Quanell X. 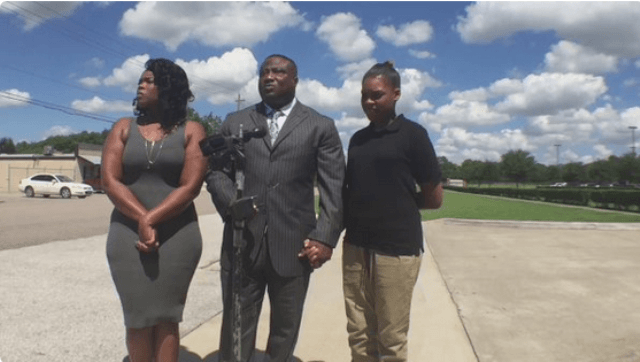 “When a Pearland ISD student recently knelt during the Pledge of Allegiance, the teacher requested that the child stand, and the child did so. The teacher did not touch or discipline the student in any way, as alleged by Quanell X. The student’s parent initially told campus administrators that the child should stand as well. According to Pearland ISD, on page 43 of their student handbook policy, parents may request in writing that their child be excused from participation in the daily recitation of the U.S. and Texas flag pledges. “State law does not allow your child to be excused from participation in the required minute of silence or silent activity that follows,” the district commented. Owens plans to sign the waiver so her daughter will be free from reciting the Pledge each day. Thursday morning, KPRC reported the school district will allow Madria to kneel during the daily Pledge of Allegiance with her mother’s written permission. A district spokesperson said the involvement of Quanell X “did not sway or impact” their decision.